Why are firms like HfS, PAC and 451 rising in influence? 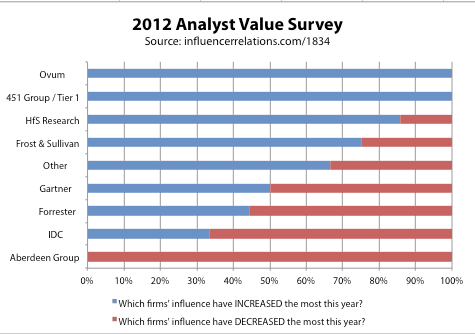 According to a record number of participants who took the 2012 Analyst Value Survey the firms that have become more influential this year are Gartner, Forrester, HfS Research, Ovum, IDC, 451 Group and Frost & Sullivan. Amongst other questions, the survey asked participants which firms rose or fell the most during 2012. 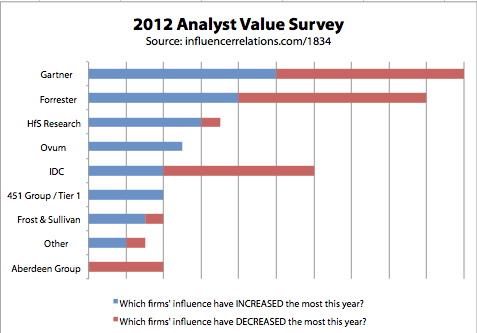 The firms most mentioned are in the chart below. Paradoxically, the four firms that were also said to have most fallen include three of the firms said by others to have risen (Gartner, Forrester and IDC), as well as Aberdeen Group. One participant, commenting on a draft of this article, said “Aberdeen dropped in opinion or influence over the past couple of decades because it was seen increasingly as a pay-to-play marketing machine. This doesn’t sit well with executives and AR pros.” While that’s somewhat true, Aberdeen is still around because it offers value to some of the vendors and to its readers. A total of 198 users of analyst research participated in the survey. The chart below reflects the opinions of 70 people who responded to one of the trickiest questions: which firms have risen or fallen the most. The survey is not perfect: non-random participants were invited through twitter, and invitations were sent to my LinkedIn contacts, subscribers to the Analyst Equity newsletter, and to past participants in analyst relations events. As a result the participants reflect those folk: 41% are from the Americas, 52% from EMEA and 7% from Asia-Pacific. On average out of every seven participants, roughly three work for telecoms or technology solution providers, two work for private sector firms, one is an analyst and one works elsewhere, like the public or non-profit sectors. We have a few initial observations about these results: generally it shows two contradictory viewpoints exist: some folk feel the big three (Gartner, Forrester and IDC) are winning more; others feel they are winning less. If we were to mimic the approach of the Net Promoter Score, and subtract the numbers of people who feel each firm has fallen from those who say it has risen, then the firms with the greatest net improvement are: Ovum; HfS Research and 451 Group / Tier 1. Honourable mentions also go to Pierre Audoin; Constellation, TBR, Infonetics and Saugatuck. We like to focus on the positive so, with apologies to the colour-blind, let’s drill down on the firms who are said to be most increasing. This year’s survey spotlights a number of second tier firms which have risen over the last few years. While it shows the change, it doesn’t fully explain the causes. I’d love to hear your thoughts about why these firms are rising, or falling. Founded only in 2010, the rise of outsourcing and cloud solutions has allowed HfS Research to build momentum. The firm has been ideally placed in a growing niche, making its own growth much easier. Its pace has been accelerated by the changes at the Everest Group, which has lost some high profile (and high quality) consultants to HfS. Pierre Audoin Consultants is a long-distance runner. Founded in 1976, the European firm has attracted a very specific type of analysts (including some talented Gartner and Ovum alumni). PAC looks for ‘five-legged sheep’ – the very rare analyst animal that can research, analyse, consult, present and project manage. It also made a substantial advance by purchasing Berlecon and building up a strong base in Eastern Europe. The 451 Group is something like a US doppelganger of PAC, but without PAC’s strong focus on consultancy. Currently limited to the US and Europe, the swift pace means that time-poor vendors especially value its crisp research. Through Tier 1 Research and the Uptime Institute it has a unique footprint. It has also attracted some excellent IDC and Ovum alumni. Right now, there’s a lot of M&A chatter at the moment involving The 451 Group, and we expect it to announce at least one major acquisition in 2013. Frost & Sullivan is perhaps the most surprising name, but it too was mentioned by a few participants. Frost’s secondary research centres in cities like Chennai, San Antonio, London, Kuala Lumpur and Singapore have given it a low-cost niche in market sizing across several industries, which are highly valued for vendors’ market entry and market intelligence activities. There’s one other firm we should mention. Constellation Research is another 2010 birth using a flexible model combining full-time staff and self-employed analysts. That gives the business a wide pool of talent, and puts its strong business development team to work. Its social media savvy and entrepreneurial edge gives it a distinct place in the market (PS read this 2014 post too, which goes into the pro’s and con’s of the model in more depth). The recession has produced some extreme environmental change in the analyst industry. Many of the best-rated firms are those which are most flexible in working with vendors, partly because many of the respondents to the survey are vendors. One participant said those analysts “do not harp on the traditional subscription-based research and put more focus on consulting, advising, etc.” Many of these firms, like PAC, hire analysts with strong consulting skills. As a result, their consulting and custom project revenues are closer to two-thirds of their total, while firms like Gartner and Forrester have consulting revenues that are less than one third of the total. It’s interesting to contrast these results with the findings from 2006, before the profound shake-up since the credit crunch. As in 2012, the top three firms were Gartner, Forrester and Ovum. Back in 2006, the second tier rising firms were Aberdeen Group, AMR, Burton Group and IDC. Aberdeen’s value is now much less clear to vendors, while AMR and Burton Group have been bought by Gartner. IDC’s position is largely unchanged. Next year I’ll be especially interested to see how firms like Bloor, Quocirca, Real Story Group, RedMonk and Securosis fare. Those are the firms which, on the basis of free-text comments in our survey, we should be watching especially closely in 2013. P.S. This is an annual survey. The September 2013 findings are on slideshare. For more recent results, get in touch.